When writer and photographer Tom Graves began photographing veterans in 2001, he could not have imagined he would spend the next decade meeting veterans, photographing and interviewing nearly 300 of them. He says it's not the history that grabs him, it's the men and women themselves, once full of youthful potential until war got in the way. This is the story of nearly every American generation, and Tom believes it is up to the older generations to teach the truth about war to the younger ones, urging the veterans he meets to give that gift to their families. Nothing is more valuable, he says. Among the many veterans Tom met and interviewed, the Nisei struck him as special. The government saw their military service as an experiment: would these men be loyal? They were assigned to segregated combat units while 120,000 of their family members were locked in prison camps. "Many people I meet ask who would fight for a country that so mistreated a people? The Nisei. Their parents' directive was simple: 'This is your country. America has been good to you. Die if you must, but don't dishonor yourself, your family or your country.' The soldiers added three words of their own: Go For Broke! These are the men and women I grew to know so well." Tom studied portraiture with Philippe Halsman and taught for seven years at Parsons School of Design/The New School (now New School University) in New York. In his 40 years’ professional experience, photography has taken him to five continents and to all 50 states for America's largest companies and The New York Times, People, and Time magazine. Since 2006, Tom has spoken and exhibited at dozens of events and venues, including American Legion National Convention, California Military Museum, Commemorative Air Force, de Young Museum, Fort Knox, Historic Building 640 Learning Center, Houston Museum of the Holocaust, Japanese American National Museum, Manzanar National Historic Site, Marines Memorial Club, National Japanese American Historical Society, National Steinbeck Center, Nisei Veterans Committee, National WWII Museum, Oregon Historical Society, Rice University, Presidio of San Francisco, San Francisco City Hall, University of California San Jose and Webster University. 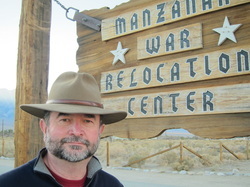 He is historian of the Joe Rosenthal Chapter of the USMC Combat Correspondents Association. Tom is leading the effort to name a Navy warship for Joe Rosenthal, the photographer who took the iconic Iwo Jima flag raising photo. You may sign his petition at www.USSJoe.org. Veterans portraits as displayed with their interviews at Manzanar National Historic Site in California.